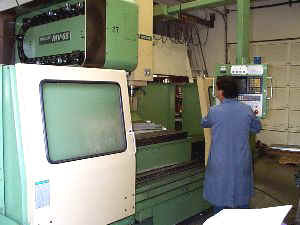 This Mori Seiki MV-65 machine is the mid range of our vertical milling department. It has 4000 rpm spindles, 30 tool magazines, and 4th axis capability. The MV-65B has increased X-axis travel which allows for machining longer parts. We have also added an MV-80 for large vertical milling. Equipped with 4th axis capability. Extra 10" of 'X' axis travel.